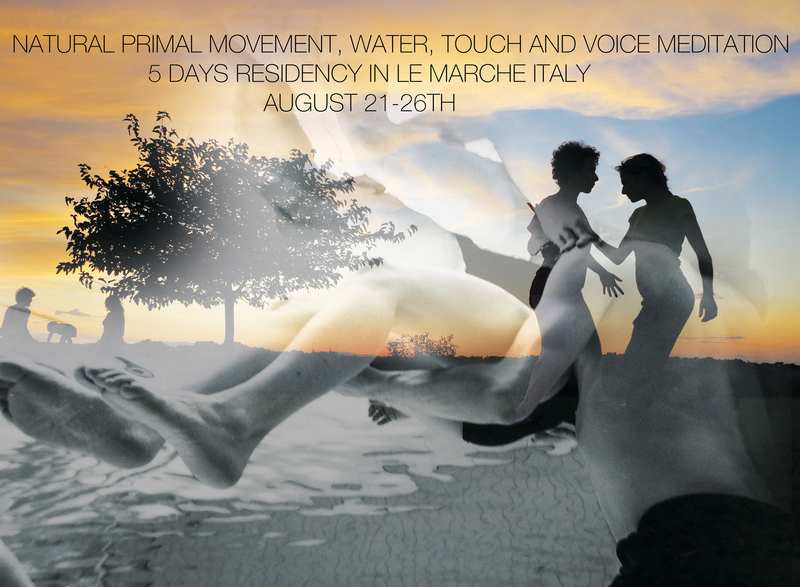 NATURAL PRIMAL MOVEMENT, WATER, TOUCH and VOICE MEDITATION…. 1. PRIMORDIAL MOVEMENT: we will dive into movements that through millions of years of Evolution have designed our bodies: walking, running, climbing trees, gathering fruits, carrying weight, squatting, pounding, hanging, pulling, pushing, throwing, etc. We will relate how these primordial movements are the ground base of many movement disciplines be it Contact Improvisation, Tai Chi, Tango, Parkour, and many expressive dances. 2. MOVING & DANCING IN WATER: Diminishing the stress of gravity on our bodies by moving in the the sea and pool, will provide us a safe environment to expand our movement vocabulary. We will then ground this experience on earth. 3.TOUCH is not optional for human development and existence. There is no movement without a sense of touch. In contact with nature, animals and human beings, we will re expand physically and socially, our sense of touch. 4. VOICE movement developed together with Kundalini and Haitian spine movements and breath will become a daily awakening or closing meditation. 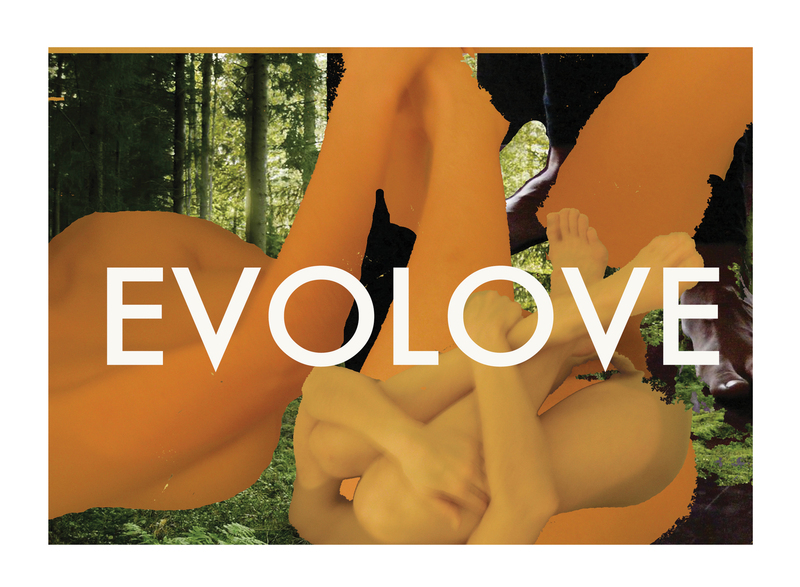 For 5 DAYS, (21-26th August), we will create an ephemeral community, gathering fruits, moving, dancing, singing, cooking, swimming, sharing stories by the fire and through movement. The farm house Il Canto del Bosco will provide the perfect setting to immerse ourselves in Nature. 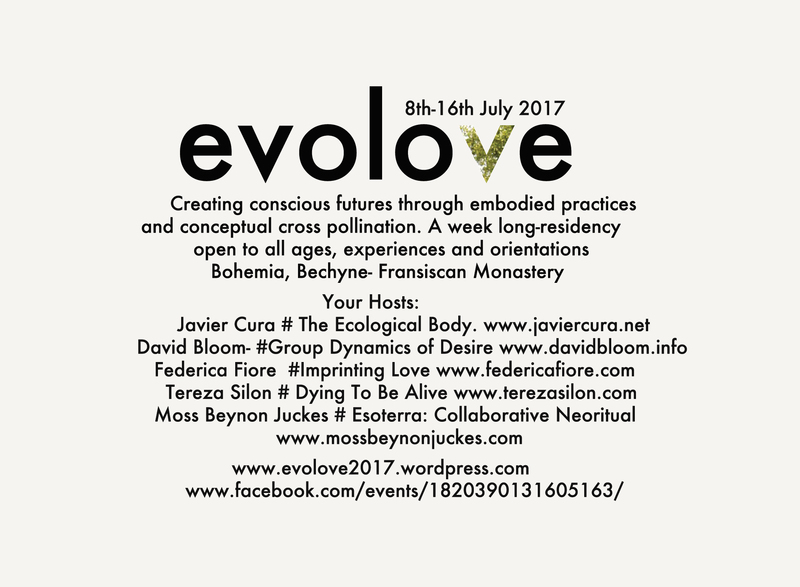 PROGRAM includes around 6-7 hours of movement work, focusing on micro and macro movements, trekking, fruit gathering and occasional jams. 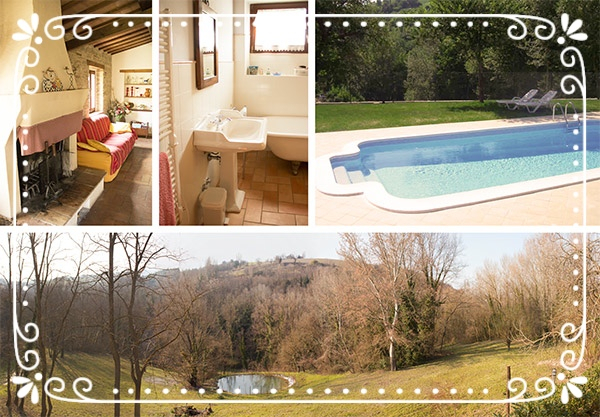 ACCOMODATION: The Agriturismo (Farmhouse) Il Canto del Bosco (www.cantodelbosco.it ), located near Poggio San Marcello (AN), Italy, offers: rooms for 2 to 5 people + pool + 3 kitchenS + Grill + beautiful surrounding gardens, forest, hills and a donkey. It is about a 15-minute drive from Serra de ‘Conti. COOKING: There are in total 3 kitchens in the 3 guest houses. Every house will take care of its own suppers. In case we are a very big group we can agree dinners with a nearby restaurant for 10/8€ for vegetarians and 8/6€ for not vegetarians. DATES: from Tuesday 21st at 16hrs till Sunday 26th at 13hrs. It is possible to come for a reduced stay of minimum 3 days. COST OF ACCOMMODATION: ranges from 15€ to 30€ per night / person according to the type of accommodation. There are also some limited tent places at a cost of 8 € per night/person in case we exceed 15 participants. MOVIMENTI PRIMORDIALI: ci immergeremo nei movimenti che attraverso milioni di anni di Evoluzione hanno disegnato i nostri corpi: camminare, correre, arrampicarsi sugli alberi, raccogliere frutti, trasportare pesi, accovacciarsi, appendersi, tirare, spingere, lanciare, ecc. Metteremo in relazione questi movimenti primordiali per ritrovarli alla base di discipline fisiche quali la Contact Improvisation, il Tai Chi, il Tango e altre forme d’espressione. NUOTARE E DANZARE IN ACQUA: Ridurremo lo stress della forza di gravità sui nostri corpi muovendoci in mare e in piscina. Questa esperienza ci fornirà un ambiente sicuro per espandere il nostro vocabolario di movimenti. Trasporteremo, infine, questa esperienza sulla terra ferma. IL SENSO DEL TATTO non è un opzionale per lo sviluppo e l’esistenza umana. Non c’è movimento senza tatto. In contatto con la natura, gli animali e gli esseri umani, espanderemo fisicamente e socialmente il nostro senso del tatto. LA VOCE verrà sviluppata insieme ai movimenti della spina dorsale haitiana e alla Kundalini Yoga. Di questo modo la voce e il respiro diventeranno una meditazione quotidiana al risveglio o nella chiusura della giornata. Per 5 GIORNI, (21-26 agosto), creeremo una micro comunità, raccogliendo frutti, muovendoci, ballando, cantando, cucinando, nuotando, condividendo storie accanto al fuoco e attraverso il movimento. PROGRAMMA comprende circa 6-7 ore di lavoro di workshop, concentrandosi su micro e macro movimenti, trekking, raccolta di frutta e occasionali Jams. Ci sono in totale 3 cucine nelle 3 case del Agriturismo. Ogni casa si prenderà cura dei propri pasti. Nel caso in cui fossimo un gruppo numeroso, potremmo concordare delle cene con un ristorante nelle vicinanze per 10-8 € per i vegetariani e 8-6 € per i vegetariani. �DATE: dal Martedì 21 alle 16hrs alla Domenica 26 Agosto. È possibile partecipare per un soggiorno ridotto di non meno 3 giorni. COSTO WORKSHOP: 170€ fino al 22 Luglio. 190€ dopo. Sconto per studenti, disoccupati e per chi ha già partecipato a precedenti workshops a Serra de’ Conti. Il COSTO DELL’ ALLOGGIO va da 15€ a 30€ a notte /persona in base alla tipologia di sistemazione. Sono inoltre disponibili alcuni limitati posti tenda al costo di 8€ a notte/persona nel caso in cui si superassero i 15 iscritti. JAVIER CURA Dopo 20 anni di ricerca, sperimentazione e insegnamento, Javier Cura ha sviluppato un approccio metodico al movimento in generale, applicandolo a teatro fisico, arti marziali, Contact Improvisation e tango. In questo sistema è confluita la sua esperienza in diversi campi e forme d’arte, dalle arti visuali al teatro, alla bioenergetica, al movimento somatico e alla linguistica. È stato uno dei creatori del Contact tango, in cui si combinano le possibilità espressive della Contact Improvisation e del tango. Come performer, coreografo, artista o insegnante lo si ritrova al Fabrik Potsdam Tanztage in Germania, al Festival di teatro Farma Dance, ad Alchemie Tango Praga, al C.I.R.A. di Strasburgo, così come ai Contact Impro Festival di Friburgo, Goettingen (Germania), o San Francisco (USA). Ha collaborato con la Libera Università di Berlino (Freie Universität Berlin) a una ricerca sull’espressione nella Contact Improvisation e nel movimento. Si è dedicato a progetti di teatro antropologici e sociali in Italia, Marocco e in Germania. Attualmente lavora nel progetto “Il Corpo Ecologico” in collaborazione con alcuni ricercatori delle Nazione Unite. “Telling stories that people believe in is the foundation of a bigger society. When stories manage to make people cooperate and work together it gives them immense power. We are coming to realise, as human beings, that the stories we have believed in have caused dramatic changes on the whole Earth. Among other concepts we have believed in the separation between Man/Woman and Nature, and in that way, we created and then became ruled by a primitive form of industrial consumerism. This extravagant belief is miles away from the reality we are now slowly coming to accept: that we have been created by, and we live because of our close interdependence with all living beings. 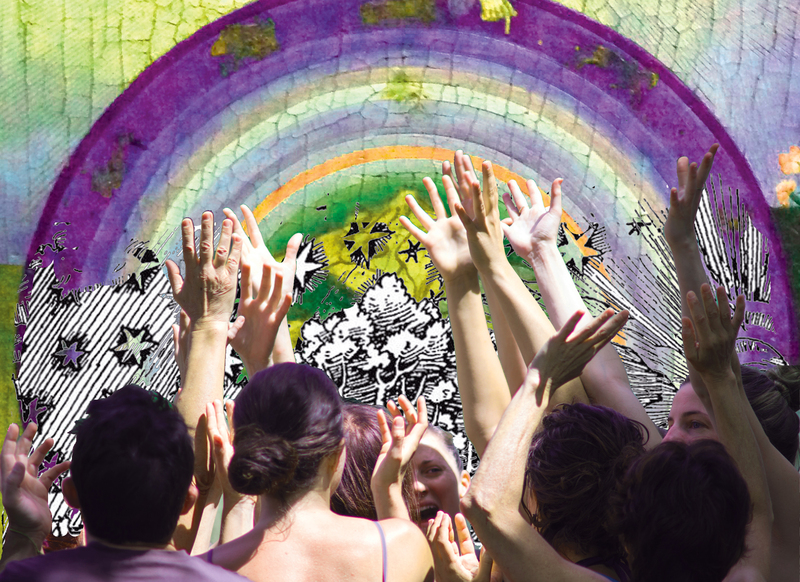 With movement, words, sounds, music and theatre, we will create and reconstruct our communal stories to nourish a deepening connection between ourselves and all things alive and not. For one week, (12-20th August), we will create an ephemeral community, allowing the complexities and contradictions of connections to manifest, exercising a pluralistic open mind through sharing and mainly, through exploring diverse ways of storytelling. Where does our stories meet and do they? How can we find moments of unity and moments of diversity and yet still nourish communication and acceptance? To invent, rediscover and communicate our stories, we will draw upon: elements of contact improvisation, martial arts, voice movement and symbolic action, music, ecological concepts, stories composition, and shadow theatre. This week residency workshop will be developed partly in the farm house Il Canto del Bosco (www.cantodelbosco.it ), enjoying its gardens, pool and the forests that surround it. And partly in the rehearsal space in the medieval village of Serra de’ Conti, in between Le Marche hills in Italy. Note: It is not mandatory to participate in the final performance. Cost: Early Bird registration up to July 22nd: 225€. After July 13th: 265€. Special discounts for students, unemployed and former participants to Nottenera workshops. The Farm house Il Canto del Bosco (www.cantodelbosco.it ) in Poggio San Marcello (AN), Italy, will host us and offers: bedrooms for 2 to 5 persons + pool + kitchen and grill were to cook our own lunch + beautiful surrounding gardens, forests and a donkey. It is only 10 mins by car to Serra de’ Conti. FRANCESCA CARNEVALI is a social and community theatre operator, graduated with a Master degree at Turin University in 2009. She conducts theatre workshops for business companies and in social communities. Since 2007 she works as an actress with the theatre company Fabula Rasa. In recent years she has devoted herself to her own research on the social value of dance Contact Improvisation.